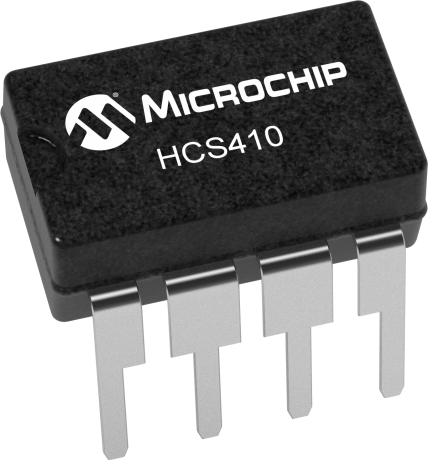 The HCS410 is a code hopping transponder device designed for secure entry systems. The HCS410 utilizes the patented KEELOQ® code hopping system and bi-directional challenge-and-response for logical and physical access control. High security learning mechanisms make this a turnkey solution when used with the KEELOQ® decoders. The encoder keys and synchronization information are stored in protected on-chip EEPROM. A low cost batteryless transponder can be implemented with the addition of an inductor and two capacitors. A packaged module including the inductor and capacitor is also offered as the HCS410/WM. A single HCS410 can be used as an encoder for Remote Keyless Entry (RKE) and a transponder for immobilization in the same circuit and thereby dramatically reducing the cost of hybrid transmitter/transponder circuits.